The Honda Civic is has been a part of the top-selling club for decades. Marking its tenth generation, the all-new 2016 Honda Civic is completely redesigned bringing a new tech-laced, larger proportioned and more-powerful-than-ever-formula to the table. Never before has the Honda Civic had such a strong hand at play when it comes to potentially being the choice for several forthcoming awards with its new redesign. The all-new 2016 Honda Civic Sedan embarks on a journey that nearly rubs elbows with midsized sedans. In that aspect, the new Civic features its largest size and first turbocharged engine, a 1.5-liter 4-cylinder with 174 horsepower and 162 pound-feet of torque equipped on the EX-T, EX-L and Touring trims only. Combining the new turbocharged engine with the latest CVT (Continuously Variable Transmission) makes for quite an economical combination without sacrificing a desirably connected feel and ability to scoot along quite well. 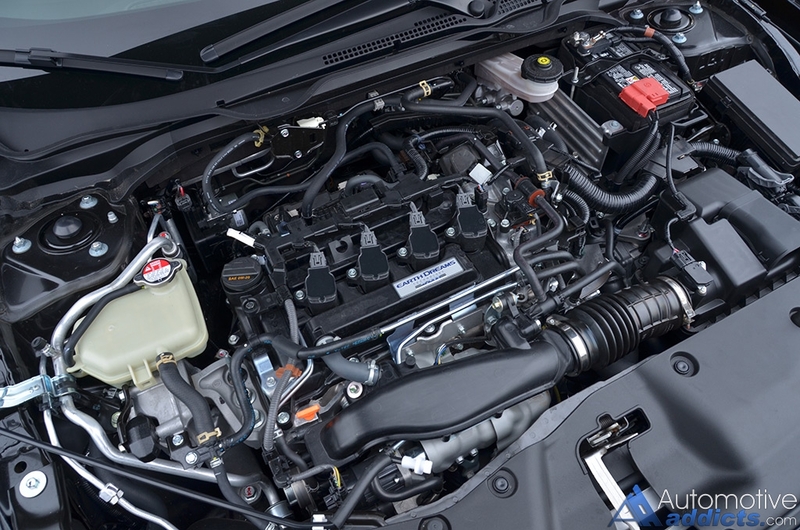 The LX and EX trims get a 2.0-liter 4-cylinder engine with 158 horsepower and 138 pound-feet of torque mated to either a 6-speed manual for the LX trim or a CVT available on the LX and standard on the EX trim. The 2016 Honda Civic Sedan Touring with its new turbocharged powertrain gets up to 60 mph from a standstill in just 7.2 seconds, among the best in its segment. Considering the decent acceleration, the rigid chassis, well-tuned suspension, and small turbo 4-cylinder, things are kept enthused without any apparent qualms from my week long adventures with Honda’s latest compact. Even the steering is compliant enough to provide a dash of feedback from its electric-assisted rack. The fuel efficiency of the Civic has always been a brightly shining aspect of Honda’s well-praised compact. The new 2016 model is no different with my Civic Touring’s turbo engine mustering out nearly 43 mpg on the highway during my test. EPA figures for the 2016 Honda Civic Touring come in at 31 mpg city, 42 mpg highway and 35 combined. While there are no steering wheel paddle shifters or a manual shift mode for emulating shift points with the CVT transmission, they really aren’t needed. I say this in considering how the programming of Honda’s latest CVT and the wide power band of the turbo 4-cylinder engine adapt quite well to most driving conditions. It’s rather doubtful that many consumers were prone to using paddle shifters or a manual shift mode in mainstream compacts, especially ones that have enough oomph from its engine that you never feel the need for additional power to overtake or jump out in traffic. 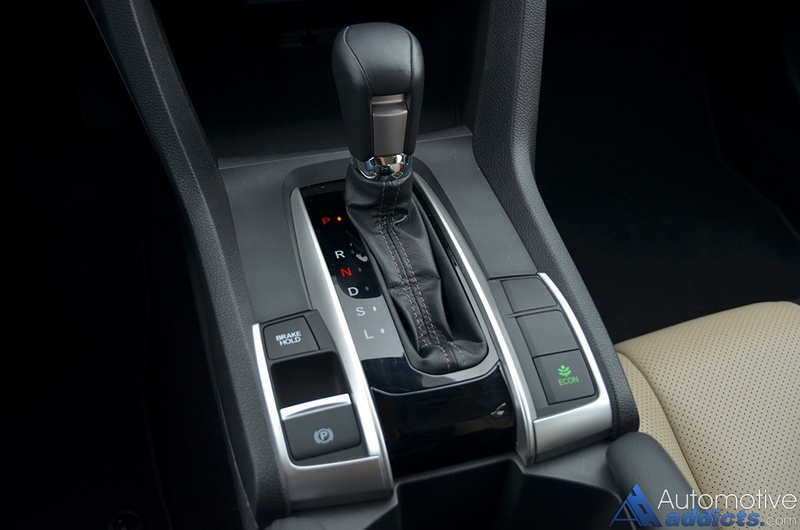 Moreover, the CVT feels much like a conventional automatic especially during upshifts with virtual set ratios that you feel being bumped up incrementally dependent on throttle position and vehicle speed. 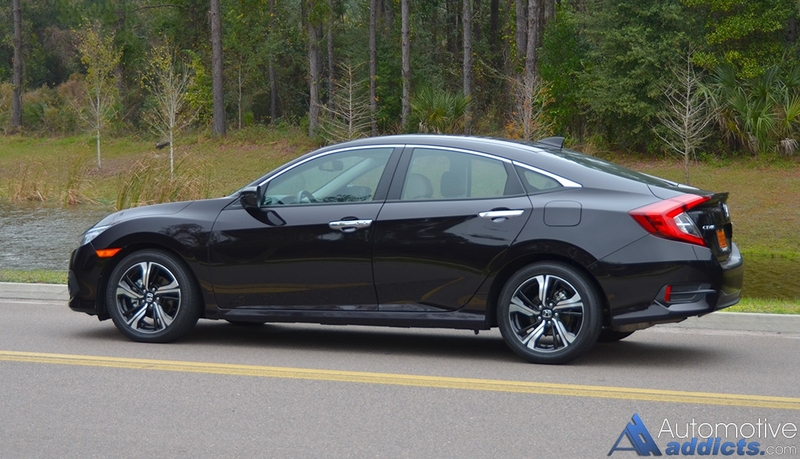 Just about every aspect of the way the new 2016 Honda Civic drives and remains well-mannered on the road is a refreshing circumvent of what I don’t like about the expected lack of performance from most compacts. Even with my animosity of CVT units, the new turbocharged Civic does something magical to help me forget that old connotation of stretching a rubber band to its limits waiting for the inevitable letdown. This week, I didn’t get my feelings hurt nor did the new Civic let me down apart from the expected audible buzz from the engine at mid to full-throttle – which isn’t a deal breaker here. Honda has undoubtedly done their homework and put in some time for extra credit with the all-new 2016 Civic. In my test vehicle’s top-level Touring trim, the Honda Civic gets several tech goodies and a nearly luxury-like cabin. 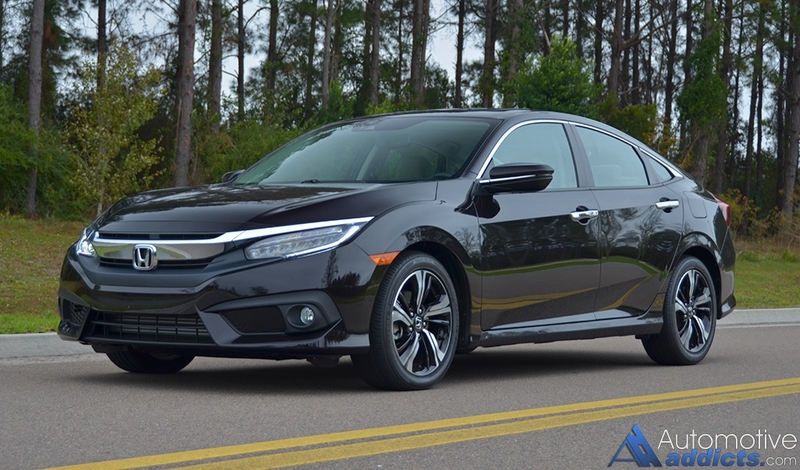 While the new turbo engine could easily make due in a midsized formula, the interior does just the same exuding a taste of what Honda’s Acura luxury brand has been doing for several years. 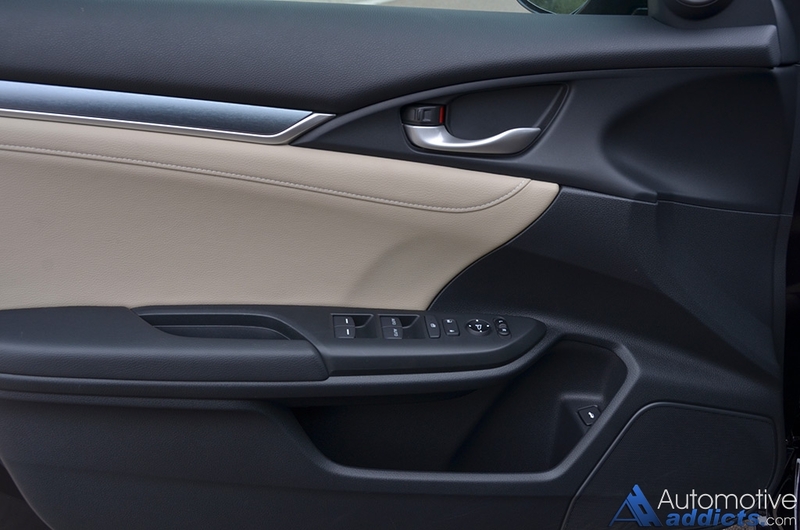 All of the controls are within close reach; the dashboard has several soft touch surfaces – as does the door trim and the encasing surfaces of the large center armrest console, which is big enough for a small laptop or tablet by removal of the sliding cupholders. Honda’s latest infotainment system proves to be their best yet in the new Civic. The touch screen interface and menu sets are quick to respond and through the use of Apple Car play, things get simplified nearly mimicking a scaled-down version of your iPhone’s screen with large colorful icons. 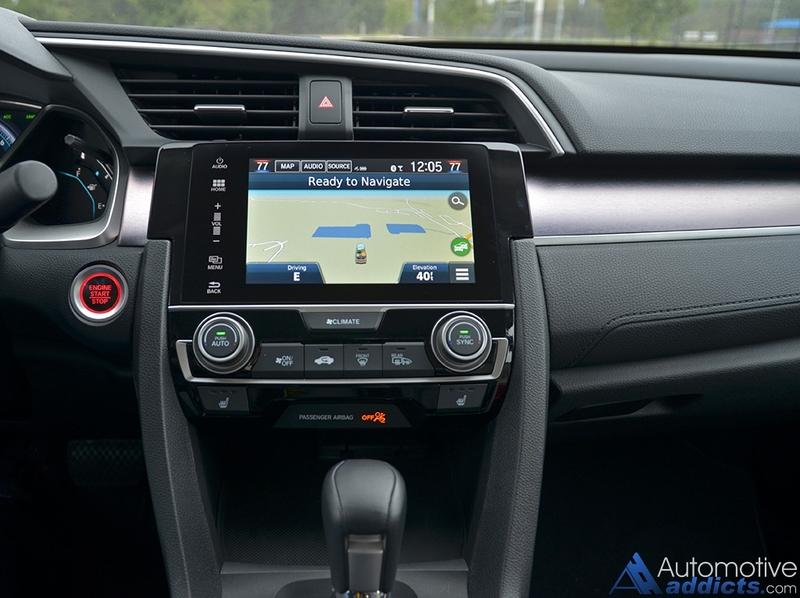 The only qualm with the Civic’s infotainment system, as found in all other new properly-equipped Honda vehicles, is the lack of a physical volume turn knob only leaving you with a virtual touch slider on the left of the touch screen. Though, the new Civic adds a nifty capacitive volume slider and button combination on the steering wheel, which you can disable the capacitive touch feature if you so desire. 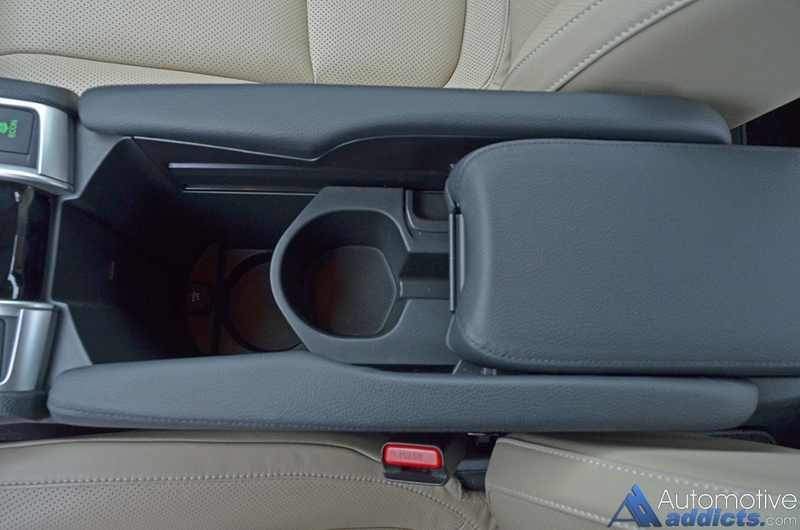 Again, Honda went the extra mile to think this through, just like having two USB ports, one deep inside of the cavernous armrest console and the other below a two-deck dashboard column that allows you to feed your cords to a compartment that fits just about any sized smartphone – even the latest iPhone 6-Plus (6S Plus). While tech has taken a literal front seat on most new vehicles, it is rare to have the availability of active safety features, such as lane departure notification, lane keep assist, adaptive cruise control, and forward collision alert and mitigation. The new Civic will nearly drive itself with all systems enabled. 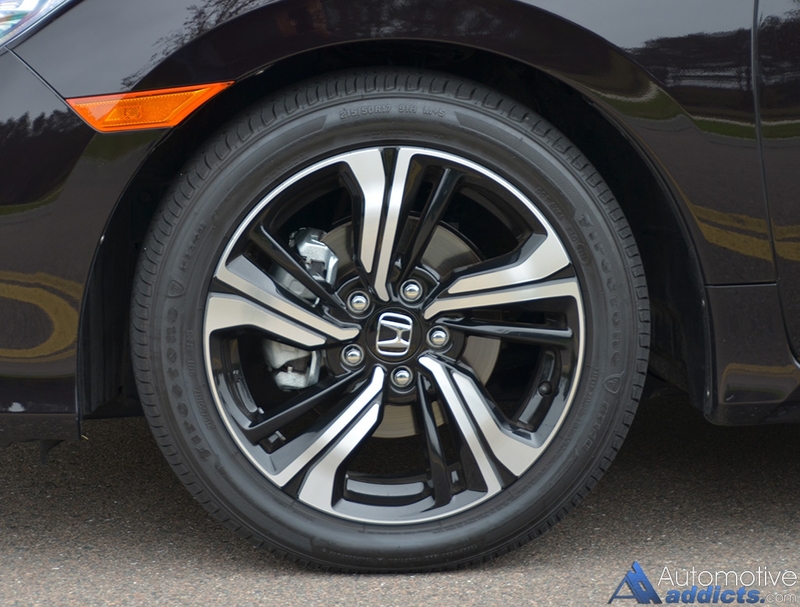 The new 2016 Honda Civic offers all of these features as part of an available Honda Sensing Feature Suite on all trims, and it comes standard on my Civic Touring trim. 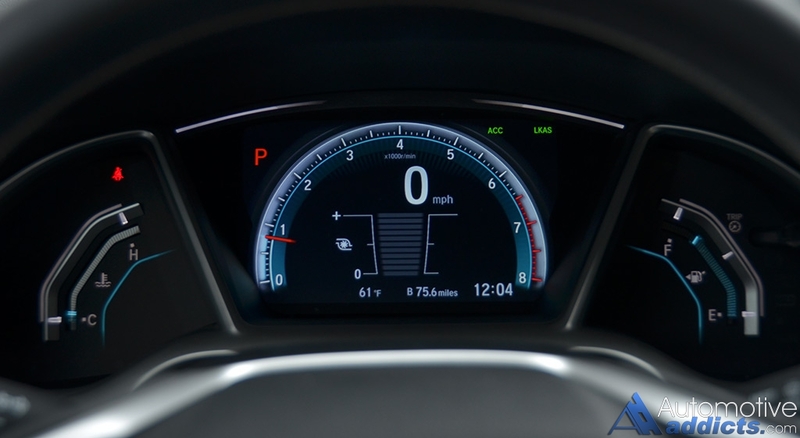 The clever use of a large color LCD information screen acting as the primary gauge cluster, displays an abundance of driver information controllable through steering wheel buttons. The simplicity of the readouts and vehicle controls retain the Civic’s inviting nature, something that has helped keep the civic in the top tier for vehicle sales for so long. 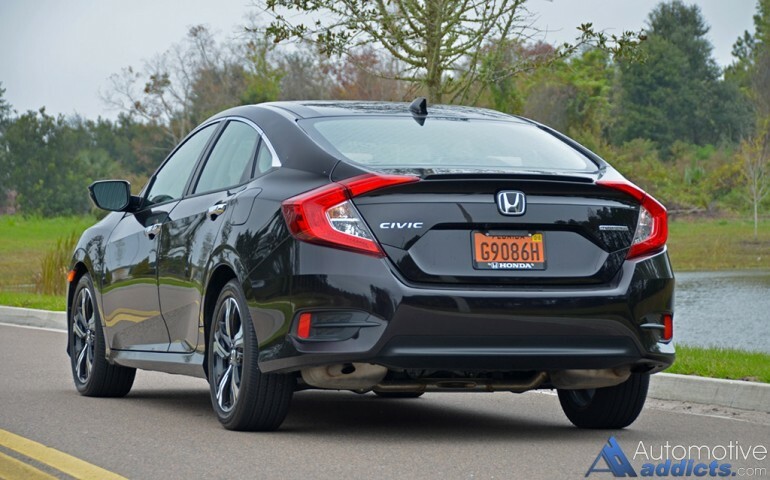 With the new 2016 Honda Civic having the most interior volume of any compact sedan on the current market, it nearly competes with some midsized vehicles – and rightfully so. Leather-trimmed heated front and rear outboard seats with the front seats having a perforation add to the limited luxury appeal of the Civic. 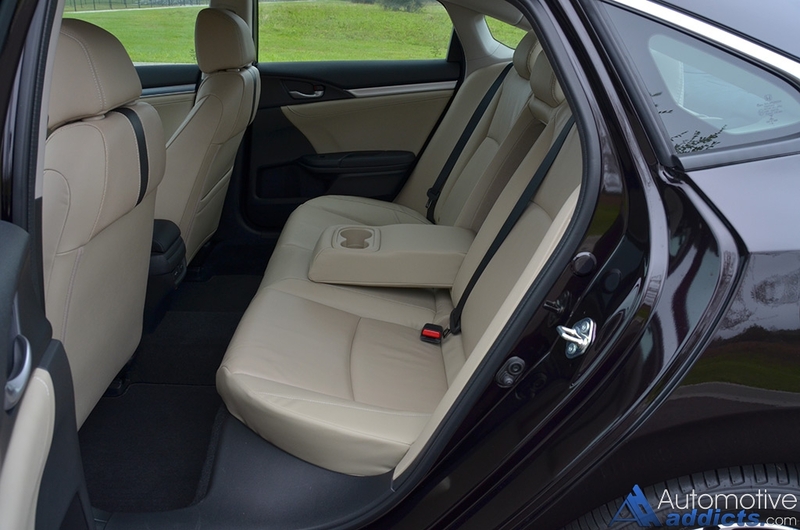 The stunning and stylish coupe-looking design of Civic sedan may trim space for entry and exit of the back seats, but there is surprisingly just enough room for someone who is over 6-feet tall to have enough head and legroom, such as myself at 6 feet 3 inches tall. 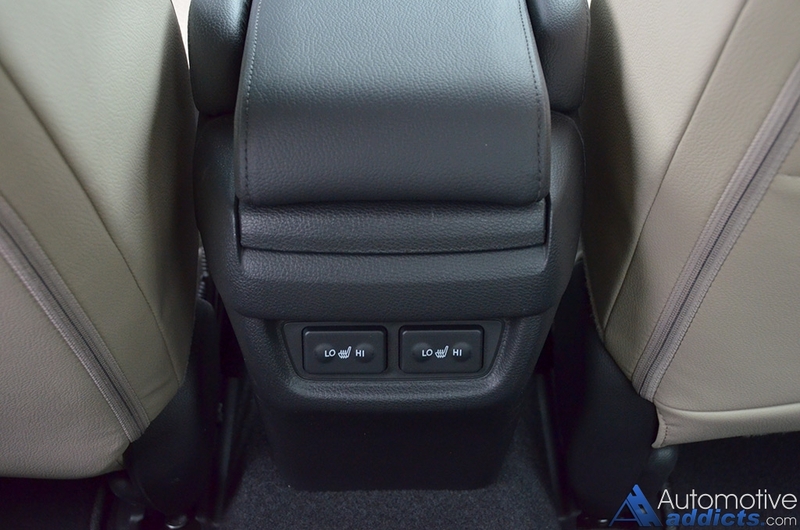 Up front, the power seats provide ample adjustability, more than enough for someone my size. 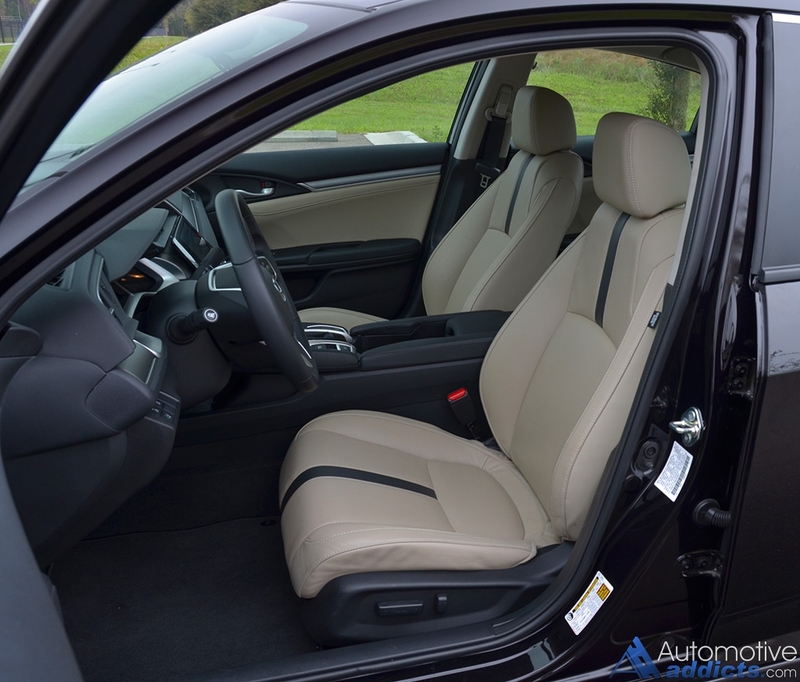 Moreover, the driver’s seat has the most adjustability I have ever found in a compact vehicle, nearly lowering the seat within a few inches of the floorboard giving you a sense that you’re riding in a low-slung sports car or exotic. The seat can also be raised pretty high for the shortest of drivers. Again, the midnight oil was burned before Honda turned in their homework here. 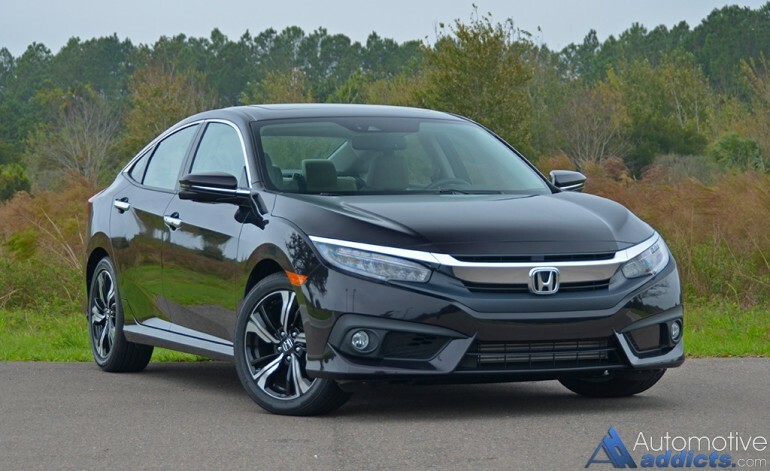 To put everything into perspective, the compact segment competition has their work cut out when it comes to competing with the all-new 2016 Honda Civic. The only pitfall for the 2016 Civic Sedan remains to be its pricing, which is slightly higher than its competition. 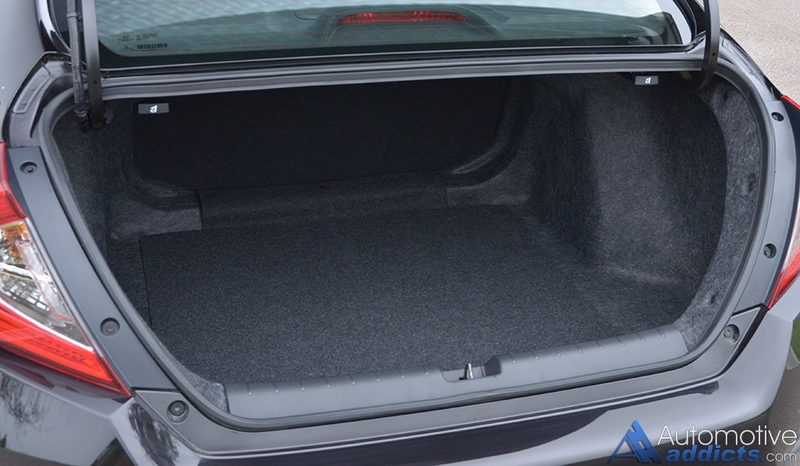 My top-trimmed Civic Touring tested out at just over $27,000, clearly a price scale that may have others cross-shopping midsized sedans, which isn’t a completely bad thing. Though, if you consider the sheer size, amenities, performance, and active safety tech, the new 2016 Honda Civic may be one of the exclusive, low-cost alternatives to shopping the midsized segment. The new 2016 Civic can still be had in its base trim starting at $18,640. In its tenth generation, the Civic has matured beyond expectations and may start to redefine the compact category, or at least move the bar a little higher for everyone else.